You have a pig? I'm so jealous! I love pigs! Oh my goodness! That is just the sweetest picture ever! My daughter just finished reading Charlotte's Web and is obsessed with pigs and farm life! Ack, the cuteness! My daughter wants a pet pig. I've heard they're brilliant. Oh my goodness that is the cutest photo on so many levels! The pig jumping up and the little one with boots and a diaper on! Total cuteness! Looks like that pig is really wanting what's up there! Your son with those boots is darling! Oh that is an amazing picture! Does she have a treat in her hand or is it just a very happy pig? She has a treat- 'JUMP' is her favorite trick. My children have always wanted a pet pig. They will flip when I show them this photo. 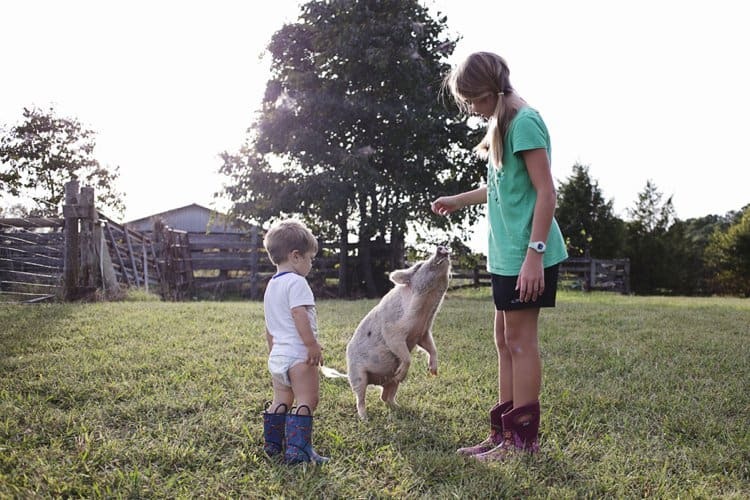 I love that your kids play with your pig! That is awesome! We had a few pigs many many years ago when I was younger. They would run to the fence to greet us whenever we came near. This is just precious!! Such a sweet photo!